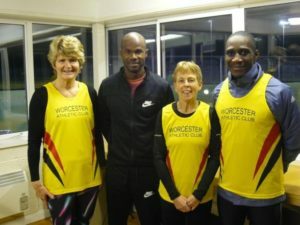 (UK) TRACK star Kim Collins took a break from his busy IAAF World Tour schedule for a surprise visit to Worcester Athletic Club. Joining the athletes at one of their regular Tuesday night training sessions, the evening was far from normal when the former world champion strode through the gates. Collins, who competes for St Kitts and Nevis in the West Indies, has represented his country at six Olympic Games from 1996 to 2016. He also holds the world record for the 100 metres for a man aged 40-plus at 9.93 seconds and is the oldest person to run sub-10 seconds. At the Worcester track, Collins signed dozens of autographs and an untold number of athletes took selfies with the gently-spoken superstar. The club’s Roger Garland said: “He chatted with club officials, athletes, parents and friends in such a relaxed and friendly manner it was easy to see why he is such a popular guy on the global athletics circuit. Collins, has announced his retirements after his appearance at the World Indoor Championships in Birmingham this weekend.